The Seattle VR Hackathon ran over the weekend of April 21-23, 2017. The idea we came up with as a team for this challenge was to give the passengers not by the window seats a possibility to tap into flight information, point of interest along the route so the air traveller can familiarize with the landscape, and landmarks or urban areas they fly over. The table of elements is a evolving design document that was used by 8ninths and then modified by Juan Guillot Gonzalez (Editor in Chief for HaloDestiny.net) to include Mixed Reality Design Methods. We used this table and trimmed down what elements we wanted to include in our experience. The table elements we planned to use is below. After talking with some of the Boeing Engineers, who were onsite as mentors, we decided to add an option for the user to view a live feed of the external aircraft cameras. The live camera feeds would not include the same interactions as the main experience (i.e. interacting with interest points/landmarks), but would simply be a separate viewing experience of the external cameras. We had a lot of issues finding the correct map for the prototype. After many failed attempts, we landed on using Mapbox for the aerial map rendering (https://www.mapbox.com). The IA had three main experience points. One was the external cameras, were the user could view the camera attached to the plane. We talked with the Boeing engineers and they let us know it was possible to tap into the camera feeds on the aircraft. The main experience was the HoloFlight. 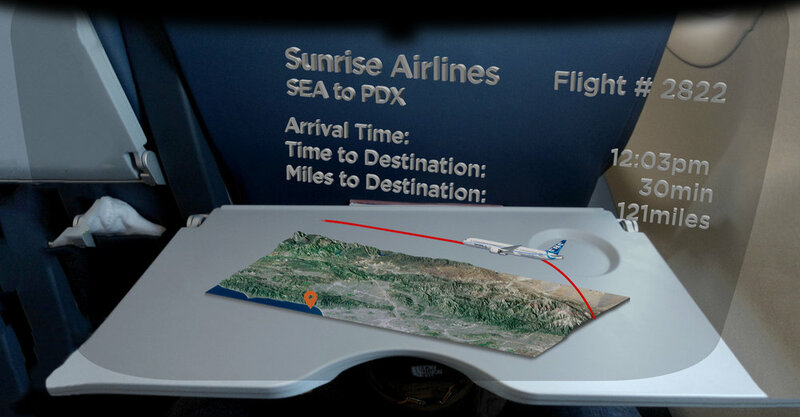 The third area was the flight tracker (right) which allowed the user to see a 3D rendered view of where they were with topical information on the flight and surroundings. We were able to do a simple proof of concept of an air traveller seeing multiple points of interest as they are “flying” over the greater Seattle area, by gazing and then clicking to view the pop-up item info panel. The pop-up info panel provides the information to make it attractive to “bookmark” the POI and store it for further exploration (road-trip, visiting museum, fine dining you name it). We also created some 2D mock-ups of the rest of the experience. Formed a team of like-minded engineers who didn’t know each other before the start of the VR Hackathon. We able to pitch as a team a mixed reality experience that transcends and connects with the future vision of Boeing’s exploration of inflight passenger experience. Most team members were new to working with the Microsoft HoloLens Mixed Reality device at the start of the project and went home after 32 hours of hacking with a deeper knowledge of how to develop a mixed reality experience for the aviation industry. John Scacciotti – Research and assembly for locale/landmark directory. Sacha Retif – Research and assembly for locale/landmark directory.